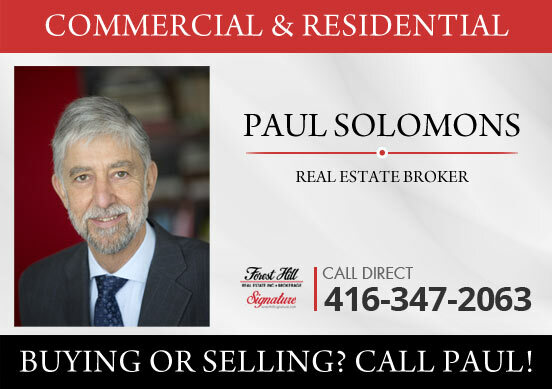 Paul Solomons is a well versed real estate professional committed to providing a stress-free real estate service experience to both buyers and sellers in Central Toronto and GTA real estate market. Call Paul For All Your Real Estate Needs! This is a testimonial letter in support of an incredible real estate agent. Throughout the process of selling our home and purchasing another residence, we were extremely impressed by Mr. Paul Solomons’ continued professionalism, integrity, and dedication in what is usually for most people a somewhat harrowing ordeal. Our experience with Paul is simply this: in surpassing out net revenue expectations he applied the most appropriate strategies and tactically placed us in the driver’s seat during all the negotiations. We learned a great deal from him and aside from bottom line considerations what most impressed us was how skillful he was in preparing us for the process and guiding us to the appropriate appreciation of market dynamics. Paul helped us to become savvy consumers. On his timely advice, we agreed to wait for the right offer and not just settle for closure, which we could have done with three earlier separate offers. At every stage of the sale of our home and purchase of a new residence much congruent with our needs, Paul was the consummate professional. He identified the right solution for us very rapidly and saved us a great deal of aggravation in our search and negotiations. Even his organization and deployment during the open houses left nothing to chance. We are delighted to say that Paul’s efforts on our behalf more than paid off and we would recommend Mr. Solomons with our highest recommendation to anyone seeking a reliable, professional, and conscientiously dedicated real estate agent. PaulSolomons.com offers powerful real estate tools for people looking to sell or buy Wychwood Heights real estate, Hillcrest Village real estate, Casa Loma real estate, Forest Hill real estate, real estate in The Annex, Midtown Toronto Real Estate, Central Toronto real estate, and Toronto real estate. This real estate website allows you to search the MLS for Toronto, Canada homes for sale, access Toronto, Canada real estate and community information and learn about home sale trends in City of Toronto, Canada.